How you choose to cut a circle in plywood will depend mostly on how perfect you need the finished cut to be. 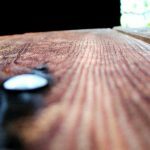 The simplest technique will be to use some kind of compass to draw a circle on the surface of the wood, and a jigsaw to cut out the circle. Do not use a piece of string and a pencil to draw such a circle; it will not come out even. A piece of wood or a steel ruler will work much better. 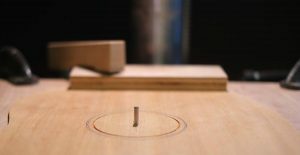 Make a firm mechanical connection for the pencil, pen or scribe point (in some cases a nail or screw can be used to scratch a line) and, in a similar way, make a firm pivot point at the center of the circle. When making a cut with a jigsaw, pay special attention to the blade. Some blades are designed to give smooth cuts without saw marks and others are designed for circles with a tighter diameter. There will be a tendency for the lower part of a blade to “pull” to the outside of the circle, giving a not-square edge. High quality blades will have less of a tendency to do this but a certain amount of outer pull is unavoidable on tight curves. There are several ways that ‘not-square’ cuts can be corrected. In fact, it is common practice to create plywood circles in two stages. First, a slightly rough or quick cut to within a few mm of the desired size is made. Then, this cut is refined. This second stage can be accomplished in a few different ways. For the most refined finish and perfect cut, it will be necessary to set up some kind of “jig” (a temporary setup, providing some kind of mechanical guidance to either the wood or the cutting or sanding tools in use.) Ultimately, cutting by eye and hand will never give perfect results unless you are prepared to spend extended amounts of time hand finishing the cut with sand paper and files afterwards. Using a simple jig to guide a jigsaw on a curved or circular cut can give very good results, if used intelligently. Most jigsaws are setup to accept a gate or guide, which in most cases are not very useful. However, these gates do allow, with a little imagination, the attachment of an extension. For instance, a wooden or steel baton, anchored at the center of your desired circle, can guide a jigsaw and result in an exact cut. In a similar way, rough initial cuts can be refined using a hand-held router attached to a guide, pivoting around a center. Band saws will give a straighter and more even cut than a jigsaw but a different kind of jig will be needed. In most cases, it will be necessary to first make an initial rough cut, leaving a small amount of material still to be removed. Then it will be necessary to find some way of pivoting the plywood itself around a center and to position the band saw appropriately to make the cut. A similar setup could be used to pass a piece of plywood across a router table after an initial rough cut has been made.